Not able to pass the text at the input fields. Please help, I have tried all the properties like id, class, content-desc, etc. [BaseDriver] The following capabilities were provided, but are not recognized by appium: BROWSER_NAME. [debug] [AndroidBootstrap] [BOOTSTRAP LOG] [debug] Registered crash watchers. 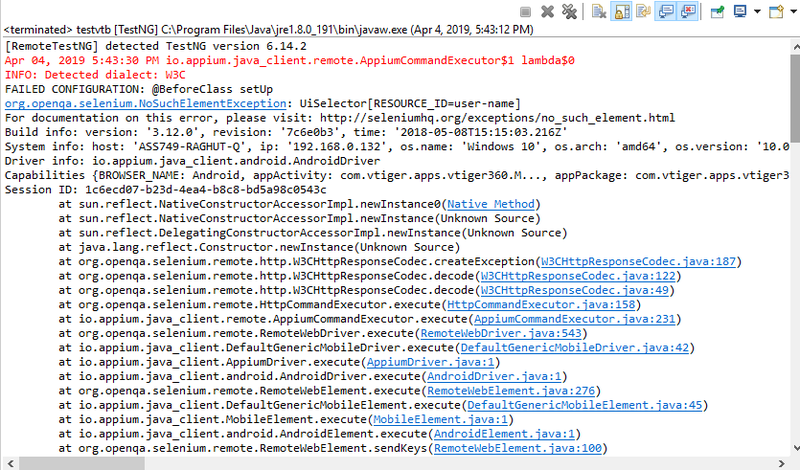 [debug] [AndroidDriver] Not cleaning generated files. Add clearSystemFiles capability if wanted. [BaseDriver] Number capability passed in as string. Functionality may be compromised. [debug] [AndroidBootstrap] [BOOTSTRAP LOG] [debug] json loading complete. [debug] [AndroidBootstrap] [BOOTSTRAP LOG] [debug] Attempting to clear using UiObject.clearText().